Members of the Gurkha Crew train at the Patan Multiple Campus field. A group of young boys are taking open fields by storm with bats – and no, they aren’t violent – they’re athletes. Members of Kathmandu’s first independent baseball club, dubbed the ‘Gurkha Crew’, the team aims to display the same kind of strength and courage as the famed soldiers in its own bouts. The club was started last year by its current general-secretary Dinesh Bajagain, who was introduced to baseball by an American classmate. Bajagain, 26, a Master’s student in Sociology and Rural Development at Patan Campus saw the team sport as an opportunity to engage youth with something constructive and help them lead healthy lifestyles. 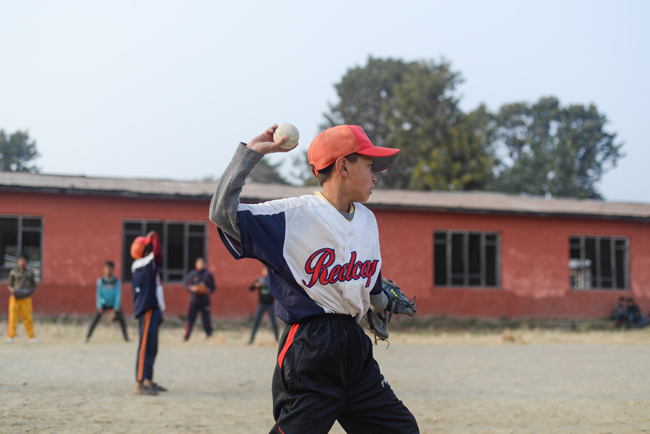 There are other baseball teams in Pokhara and Bhaktapur, but unlike those, this Kathmandu club is not affiliated to any school. With more than 20 members ranging from 10-14 years of age, the team trains daily at the Patan Multiple Campus. The boys gather to practice pitching and batting under the supervision of their coaches. In the evenings, they play a final game to hone their skills.Even though baseball is not commonly played in Nepal, Bajagain saw that it had potential to grow in popularity due to its similarities to cricket. He was then inspired to pass on his love for the game to the youth in his neighbourhood, leading to the formation of the club in June last year. Besides keeping players physically fit, the club also stands as a symbol against divisions in society and believes in providing a level playing field for all youth regardless of age, race, or family background. “Anyone who wants to play is welcome to join us,” said Bajagain. In conjunction with the Nepal Baseball Federation, which promotes the sport by organising competitions among the few baseball clubs here, plans are underway to involve the Gurkha Crew in the formation of Nepal’s first national baseball team. A NPO “Nepal Baseball Club Laligurans”（President Yohei KOBAYASHI）supports activities of Nepal Baseball Federation (President Pradeep Shrestha) to promote baseball in Nepal by sending coaches, equipment from Japan as well as inviting junior baseball players to Japan.